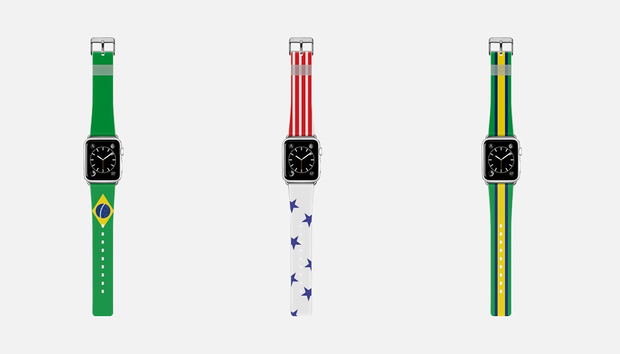 Last month, Apple revealed a collection of Olympic-themed Apple Watch bands depicting the national flags, but you can only buy them from an Apple Store in Rio de Janeiro, the 2016 Olympics host city. Now, Apple Watch wearers can show their team spirit without having to travel to Brazil. Accessories maker Casetify has an Olympic capsule collection currently on sale. These 20 bands are also inspired by the flags of national teams competing in Rio, including the U.S., Germany, Japan, Australia, and Brazil, of course. Casetify’s Olympic bands costs $49, the same price as Apple’s official straps. The only difference is that the Casetify bands are plastic for a more athleisure style, while Apple’s bands are made from the new woven nylon material that the company debuted back in March. If you don’t own an Apple Watch, Casetify’s Olympic collection also includes cases for iPhones and iPods, from the iPhone 6s and dating back to the iPod touch 5. A case for an iPhone 6s Plus costs $40, while a case for the iPod touch 5 is $30. The impact on you: Apple Watch wearers who are in Rio for the Olympics will find it worth it to try to swing by the Apple Store inside the VillageMall to purchase an official Olympic band. The fact that these are limited-edition and are only available in one Apple Store in the world means that you will be able to resell it as a collectible item. For the rest of us, Casetify’s collection offers a more convenient alternative. This isn’t the first time that a third-party accessories maker has made a limited-edition Apple Watch band more accessible. Last week, Clockwork Synergy unveiled a rainbow-colored Watch band that’s near identical to the promotional one Apple gave its employees who marched in the San Francisco LGBT Pride Parade in June. Both versions are made from woven nylon. Clockwork Synergy’s Pride band can be pre-ordered now for $25, and it will be available on August 30. You can also find Apple’s rare Pride band on eBay for over $400.